Always envied the watery-light dewy skin of korean celebrities from your favourite drama serials? That dream may be closer than you think, thanks to popular skincare brand DCS’ skin-loving formula transforms dull, dry skin to healthy, glowing skin. 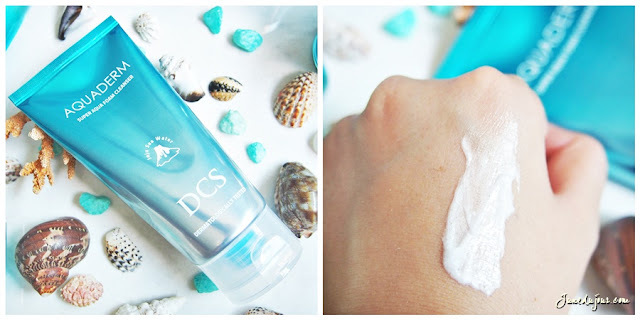 Like most skincare regimes which has a core special formulation that makes its efficacy, DCS's secret lies in its volcanic seawater ingredient. It features a blend of various mineral nutrients such as Selenium (an antioxidant mineral that helps maintain skin suppleness and strengthens cells from free radical damage). and Zinc to alleviate acne-caused blemishes and reduce excessive sebum production. It is also coupled with Agave Cactus extract that acts as a humectant to lock in the moisture in skin and fortify its protective skin barrier. At their recent beauty launch, we had the immense pleasure to know more about this exciting new Korean brand...and bag the entire range to experience the DCS change for ourselves! I'm quite the sucker for all thing hydrating, so here we go! Very generous amount given the size of the tube; just a small 20c dollop of it lathered into a rich foam. While I felt that it gave a thorough clean at the end of the day, I did feel that it has a slight waxy after-feeling when rinsed off. I did however, absolutely loved the refreshing scent and how it brightened my complexion after continuous use for a few weeks. If you are on the lookout for gentle toners, look no further than this. It's watery texture is gets absorbed quickly into the skin, which makes it great for prepping skin as well before applying makeup without caked up. It doesn't leave skin with that tightened feeling (thanks to absence of alcohol which can be drying), but rather leaves it feeling moist an refreshed. Honestly, it was this bottle that totally caught my eye..I mean how cute is the dripper packaging? This translucent white, runny ampoule is MFDS certified (meaning it has passed stringent tests by the Korean Ministry of Food & Drug Safety) to deliver whitening and anti-aging properties. Just about 2 drops was enough to cover my entire face, and I took pleasure in tapping this in before my moisturizers for additional hydration. It feels watery upon contact, but tapping gently in the ampoule is fast-absorbing, leaving a slight moist layer on the skin. If you had to chose one item only of the range I'd say go with this for maximum hydration boost. TIP: I actually pat this all over my face before slapping on a sheet mask to have a dual layer of hydration at night to replenish skin's moisture levels. This is my favourite thing to use in the range, and one that I'm looking forward to repurchase again. Personally, I felt that it was abit heavy on skin, but those who have drier, patchy skin would find this great and also for colder countries where you need more hydration than usual. Plus, it comes imbued with SPF20 PA++ so even if you forgot sunscreen, you have a mild layer of sun protection. But I will say that it was pretty long-lasting, considering I usually apply about 10c dollop for an entire day. I actually quite liked the texture of the Night Cream; I strangely found it somewhat lighter than the day cream being abit more of a gelish consistency. It gives a good level of moisturization without feeling greasy and is relatively fast absorbing so I don't worry about leaving any stains on the pillow. It leaves just a thin layer on skin which leaves skin looking refreshed the next morning. I'll admit that I did not think much about cleansing waters. I had a disappointing experience with the Missha Rose Cleansing Water years ago, and had came to the deduction that water cleansers are not so effective in removing resilient waterproof eye makeup or long-lasting foundations. So I was quite surprised: it almost effortlessly removes majority of my full-blown make-up within 1 cotton pad (I'd recommend you to go for a 2nd round to ensure full clean); with exception of my Maybelline mascara which is famous for its ridiculous anti-smudgeproof. 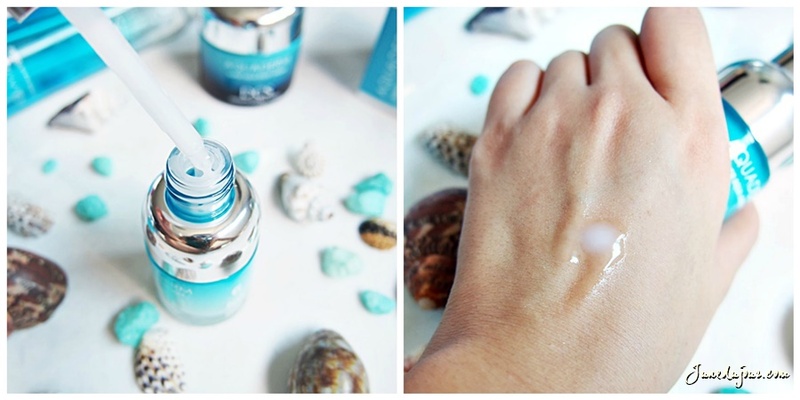 The Aquaderm range smells beautiful for each of its products, so its like a splash of refreshing ocean water on the face. My skin is left with a faint sheen that leaves it feeling comfortably hydrated yet without a sticky afterfeel. Its gentle on the skin without stripping away skin's natural moisture. Overall, I'm pretty satisfied with the efficacy of the range and I do believe this is a affordable range if you are looking into a new skincare regime, or have been thinking about dipping your figurative toes into Korean skincare..it hits all the right notes given our climate and beauty needs! 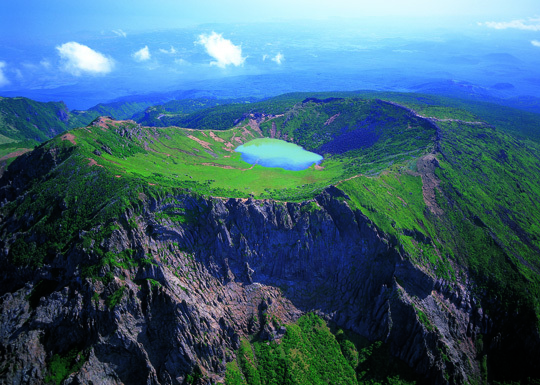 Get your slice of Jeju goodness today! 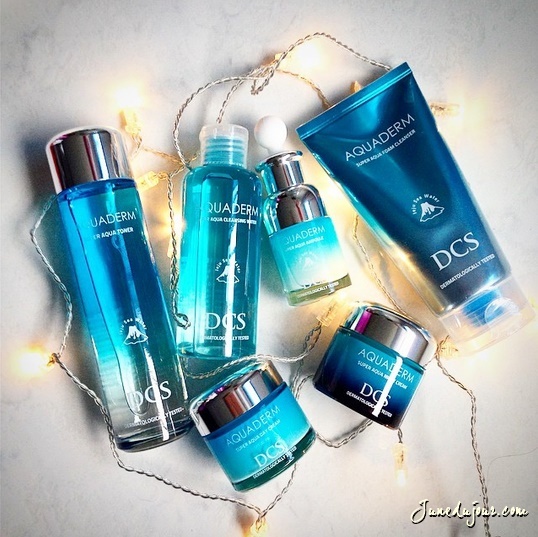 The DCS AQUADERM range is currently available exclusively at all Watsons outlets islandwide.